Make sure your party is complete with an arsenal of school supplies. Your kids will be happy with all of the new stuff and their parents will be grateful. Why Should You Throw A Party? One of the coolest things you can do for your kid during the most dreaded time of the year is throw them one heck of a party. Let's face it, parents are all about getting their kids back into the classrooms, but the kids start walking a little slower around this time, don't you think? A few years ago an idea came to mind that a back to school party would be so much fun and most importantly if I caught all the deals going on this time of year I could do so without breaking the bank. The main goal of the party is to let loose and have some fun while preparing them to get back into school mode. This can easily be achieved if you make it fun and to do this all you need is some type of dollar store, some food, and some creativity. Before we jump into the theme I would like to add that this is an amazing way to get some free back to school supplies for your kids. Stay with me, I'll share my ideas with you. You don't need a lot of different ideas for this party, all you need to do is stick with the school concept. Think of a classroom setting and let that be your theme. Think about primary colors, ABC charts, shapes, and numbers. You need someone to stand in as the teacher for a couple of school related activities and a good amount of room for the kids to interact. Take a trip to your local Dollar Tree, Dollar General, or any other type of dollar store and go to the school supply aisle where they keep things teachers use in the classroom. You'll find numbers and shape books, posters for the bulletin boards, poster boards, name tags, etc. Grab some things that you have in mind to create a classroom type setting and let this be your theme for the party and if your kid has a chalkboard, that's even better. Use it! If nothing catches your eye, here's a short list of other great themes you can use. 1. Have a Reading Rainbow theme. Purchase some books from your local thrift store and creatively display them with some rainbow decor. Check your local library for a DVD copy of the classic Reading Rainbow show and let the kids watch an episode. 2. Have an apple theme. Red plates, red napkins, apples, and apple related games. Use those apples during a game of math trivia to learn about fractions. 3. Have an alphabet theme. Include the alphabet everywhere and throw in some alphabet soup. While you're in your dollar store you can get flash cards, matching games, and puzzles for the parties activities. Also head over to the craft section and grab a few things that they can glue together and call art. Basically fuzz balls, felt, flowers, etc. They'll think of something to do with them. 1. Play gym. Gather basketballs, jump ropes, baseball gloves and take the party to the backyard. 2. Play a trivia game. Ask math related or social studies questions. Instead of giving prizes to the correct answer, give prizes for effort. 3. Have a spelling bee. Decide on a number rounds and pick a first, second, and third place winner. The dollar store has ribbons for these types of games and be sure to grab stickers for everyone else. Save some time creating treats for our party with a complete cupcake kit. Now this is where you can get those free school supplies. Plan this party with a couple of mom-friends and agree on bringing some type of school supply and make goody bags or pass them out to the kids individually. One mom could bring enough pencil packs for all kids and another mom could bring facial tissue. For the back to school party I hosted I waited for mark downs on school supplies at my local retailer and scooped up enough crayons, pencils, erasers, notebooks, paper, and other school related items to get anyone at least halfway through the school year. If you have a local church that gives out school supplies and they have any extras left over don't be afraid to ask if they have anything to give. Most churches and organizations don't mind contributing something as long as they know that it's helping someone get ready for the school year. 1. Pack of 4 ct. juice boxes for each child from your local dollar store, complete with school party theme tag. 2. 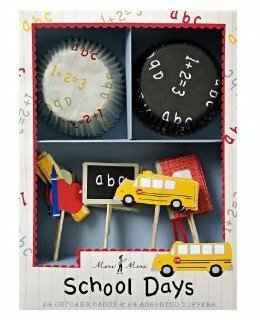 Small school kit complete with Target Dollar Spot items such as novelty pencils, erasers, notepads, etc. 3. A pack of crayons creatively packaged. 5. Art kit complete with crayons, markers, glue, scissors, and construction paper creatively packaged in boxes with ribbon. 6. A lunch kit complete with lunch making necessities such as brown paper bags, sandwich bags, and a box of lunch treats (think of fruit roll ups, packages of cookies, or any type of special snack). 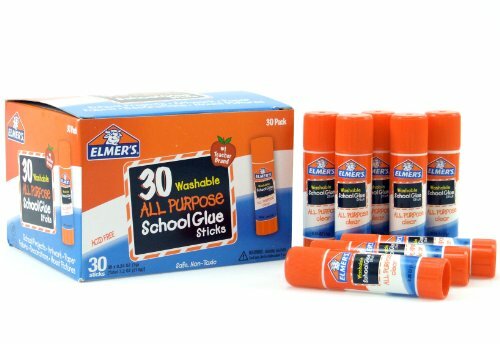 Elmer's glue will be the perfect addition to your party favor list. This pretty much wraps up all that you need to throw a really cool party for your kids. Keep in mind that it's about having fun and not spending a lot of money. There's ton of inspiration out there and with a little thought you could plan this type of party with little effort. So help cheer your kid up with some friends, games, food, and new school supplies. Have a wonderful school year!